Who ever thought that might be a difficult thing to say? OK, well, maybe that statement isn't going to get me persecuted, but I am finding myself tired of how cool it is to be a Christian and to ditch the GOP. The most recent impetus for this reaction welling up in me has been this article that I stumbled across, but this is no new thought for me. 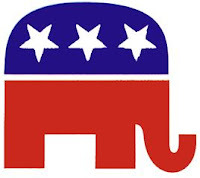 So here's my take (since you asked...): if an evangelical thoughtfully changes parties because he really thinks that the Republican party does not line up with his beliefs, I disagree, but ok. But it appears to me that going more liberal is thoughtlessly trendy. Thus the constant invocations of phrases like, "Would Jesus have been a Republican?" and the like. Maybe he would've, maybe not, but it's really not that good of a question because of how limited his mission was. There is something healthy about challenging your assumptions. But while critical evaluation is a worthwhile enterprise, I am afraid that in this case, too often that process starts with the assumption that all currently held assumptions must be wrong. The "Everyone thinks this, so it can't be right" type attitude. It's edgy and hip to be an evangelical who challenges the Republican party. The fact that Obama is so compelling and McCain is sometimes so senile doesn't hurt this. So do promises for universal health care and the end of an unpopular war. But these are exactly the kinds of things that we have to think critically about, rather than just make moves on. Is the Iraq War really that bad? Don't just say "yes" without giving me some good reasons why, and read some folks who think it isn't. Is universal health care really that good of an idea? Tell me how it won't sink the economy and end up backfiring in the process. Should we really give up on fighting abortion? Is Bush really not doing anything about Africa? Is the economy really in a recession, or just in a normal cycle? Is it really the government's fault that gas is getting so expensive? We have to think through these issues seriously, rather than just react. It is possible to be a Christian and to vote against McCain, but think about it first. Oh, and call me a single issue voter, but someone still needs to explain to me how the few thousand deaths in Iraq is worse than the 1.5 million God-imaging babies a year who die before I change my mind. A consistent ethic of life goes both ways. Good post...I think I might just respond to it on my blog :)... too much to say. Good point about counting deaths, and actually I have made a mistake here that I have condemned in the past particularly on this issue. Any idea where the stats on total deaths are available? Nevertheless, I think my point stands, as the total deaths won't even come near the deaths in abortion. The economy/recession - can't tell yet. Certainly not healthy. Depends on the sector. Great time to be in the mine equipment business. Not so good for US car manf. Is the Government to blame for Gas Prices - in part. The could release the oil reserve. They could allow drilling in ANWR, they could of never done that stupid tax break for buying "farm" vehicles. They could of upp'd the CAFE standard. They could of done real government investment in fuel cells. Now the whole reason? No. Part? Yes. There is a good reason to abandon the republicans. They are not very good christians, no matter what James Dobson tells me. which is the real reason to abandon the republicans - so much of the "christian" magisterium have sold their souls to the rebubs. I would never argue the dems are better overall. According to iraqbodycount.org, civilian death range from 83,521 – 91,094 since 2003. That's a lot of casualties amongst (presumably) innocent civilians. These people need the gospel just as badly as anyone. They should not be forgotten in the statistics. Yes, this is nowhere near the statistics for aborted babies, which is why the article you linked to in your blog is good. In the interview with Shane Claiborne, he expresses that Christians are feeling "stuck in the middle". They don't want to say okay to abortion, and they don't want to say okay to the Iraq war (for those of us who believe that we shouldn't be there). Also, changing subjects here, unfortunately I do believe that Bush has not done enough in regards to the genocide in Darfur, but who really hasn't done enough are Christians worldwide. I would recommend for people to check out an amazing ministry called Safe Harbor (safeharbor.us). God has opened a door for this ministry to the MILLIONS of people who are displaced from their homes. This missionary group is the first to not be killed trying to go into Darfur, and there is a pretty big revival taking place out there. Safe Harbor is also working in Myanmar and I am sure they are on their way to China, but I haven't checked for an update. This is where it gets hard in regards to politics. Hald of me just wants to wipe my hands of it all and focus on the task of helping to raise up the church to take care of many of these things...it's a tough thing. i think you could make this into a series of posts. next can be "I'm a Christian, and I'm a Modernist!" You could follow that up with "I'm a Christian, and I'm a foundationalist!" haha. it does my heart good to hear that might be a difficult thing to say. christianity isn't supposed to by synonomous with a particular party. unless that christianity started to make deals with empire. jesus gets sad when that happens. but people are rethinking their assumptions. thats good. but anyway, the reason i'm on this blog is because you're thoughtful - and you are here as well. i echo the point that, just because i no long wish to associate with the republicans - it doesn't mean i embrace the democrats. like so often, i don't subscribe to the dichomoties thrust upon me. i would rather have mccain than clinton because he's only mildly oppourtunist (e.g. in his relationship with fundamentalists) compared to clinton. at least he's clearly against torture thanks to his own personal experience with it - but its still more of the same. but barrack does represent the third way spoken of by mclaren, wallis, claiborne, and others. i don't care nearly as much about our economy as you might like - i care about he economy of the world - much like those who don't care which bin a particular death goes into. the travesty is that our government was never even counting iraqi deaths. speaking of false dichomoties - the iraq war isn't an either or with abortion. what are we doing about both all death and poverty (individually? systematically? or otherwise? ).